Well, here we are with a new photo manipulation wallpaper featuring the new couple of Pirates of the caribbean on stranger tides. Hahaha. Yeah, that's actually better. It's like he meets Ariel down there..
LOL HAHAHAHAH, ariel? well, it would be interesting! Loved these two in the movie!!!! Oh my lord, you have made my life COMPLETE. I saw this movie last night at the midnight showing, all dressed up in my pirate costume, and I absolutely fell in love with this couple~ They're just too damn cute, way cuter than Will and Elizabeth ever were to me. 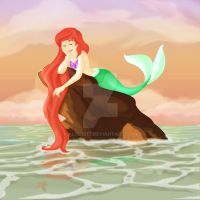 i got you, i was expeting because of the mermaids, i guess you know i LOVE mermaids! and the movie marketing for them is so big! i still loving POTC, but i am frustrated, do you understand me? The new Elizabeth Swann and Will Turner. I cannot wait until it comes out! i guess, heh, have you seen the trailler? I did after you told me.. It just had always seemed too good to me, to see mermaids in a high rated movie like ThePiratesOTC ! But now I cant wait for the 20th to come even if there are only couple of hours left till then! YAYY!! its tomorrooooooooooooooooooooooooow i bought my tickets right now! Ya I Can't wait for it but.. maybe I wouldn't go on the Premiere cause there gonna be lots of people eating popcorn, talking, screaming and just distracting me.. When I'm watching something so magnifiscent I wanna to be able to trace every detail's origin, every eye blink and the slightest hair movement.. I'm weird I know xD Still I hope I'll be able to wait few more hours. But happy watching to you!! thats, the worst potc ever! oh god, i will not spoil you, im disapointed! Very good!! That looks like its going to be a pretty good movie! it will! im so excited ! i cannot wait! Thats great!! The mermaids look pretty cool in it too! I wonder what their involvement in the fountain of youth is?